You are here: Home / Columns / Indie / News / Tequila! Beer! Dead people! The holiday season is here in LA. Tequila! Beer! Dead people! The holiday season is here in LA. Reviewed by Patrick O’Heffernan on October 18, 2018 . Tequila! Beer! Dead people! The holiday season is here in LA. LA La Land: It’s Party Time in LA! 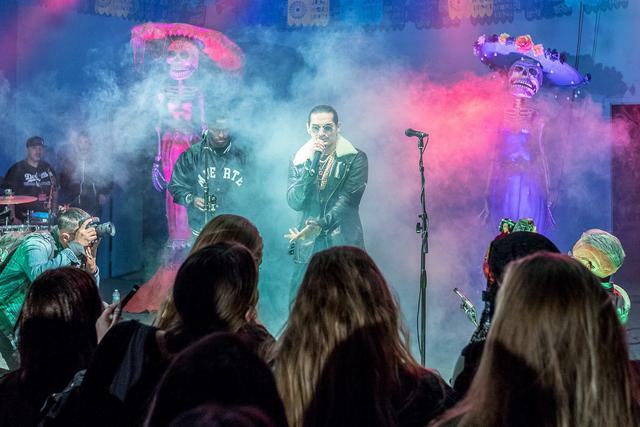 While the rest of the country prepares for Halloween, the season of the departed has already begun in Los Angeles with events leading up to Dia de Los Muertos – the Day of the Dead – a major celebration in the Southland. If you have seen the Disney movie Coco, you know about DDLM. If not, it is the Mexican holiday honoring ancestors typically celebrated in graveyards with altars, family gatherings, music and picnicking. In LA, DDLM is celebrated at the Hollywood Forever Cemetery, final resting place of movie stars, celebrities and members of many of LA’s important Latino dynasties. But while the celebration of the Dia is the focus, there is much more; there is a whole season of events which actually started for me last week at the Press Preview of DDLMLA2018, where we were introduced to Coaltlique, or “serpent skirt” a major deity in the Aztec pantheon and mother of Huitzliopochtli, the Aztec God of War. 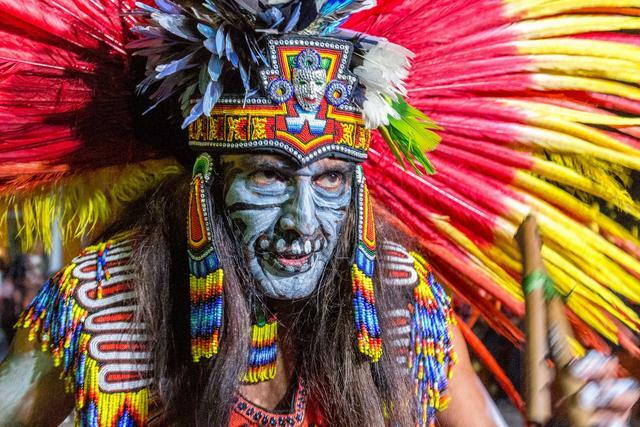 The we saw various manifestations of the Aztec legend at the Preview, including a feathered dance welcoming the 200 or more assembled journalists, and a blessing by the Aztec priestess. Representatives of the Hollywood Forever Cemetery and Criterion Agency that produced the press event were on hand to guide us through the exhibition of stunning photographs by artists from UNAM, the National Autonomous University of Mexico, one of the partners of DDLMLA2018. The exhibition was held in two huge crypts, each over a 100 feet long and 20 feet high with marble floors and walls. The floors were strewn with orange chrysanthemums and the walls held dozens of photographs of DDLM themes from Mexico. Appropriately, the crypts were the final resting places of Latino families going back generations whose names were listed on the drawers where their ashes were kept. At the end of one of the crypts a Veracruzano trio (harp, guitar, small guitar) and a zapateado dancer (Mexican tap dance similar to Flamenco) tapped and whirled in layers of flowered skirts. Outside, we were treated to tacos, Pez Cantina fresh fish tamales, mango chili lime cotton candy by Love Swirls, Estella beer and all the tequila and margaritas we wanted. Metralleta de Oro DJ’s kept the party moving with cumbia from the turntables and East LA’s renowned Carlos Se entertained with his feel-good Latino-style reggae. That was Thursday night at the cemetery. Saturday was El Velorio, the funeral, celebrated at La Plaza de La Raza in the east LA neighborhood of Lincoln Heights. Organized by the cultural event and art producer Antonio Pelayo and his family, El Velorio is a celebration of the Mexican wake, the custom of staying with the dead for 48 hours before burial. During an el velorio the deceased is displayed in an open coffin with candles at the corners while relatives and friends celebrate her or his life before they go to the land of the dead for Dia de Los Muertos. 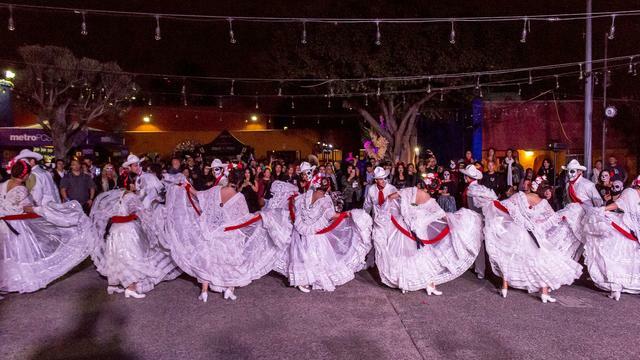 The El Velorio at Plaza de La Raza was celebrated by art, music, dancing and 4500 people, most in costume. This year was El Velorio’s 10th anniversary and it was the party to be at in LA. 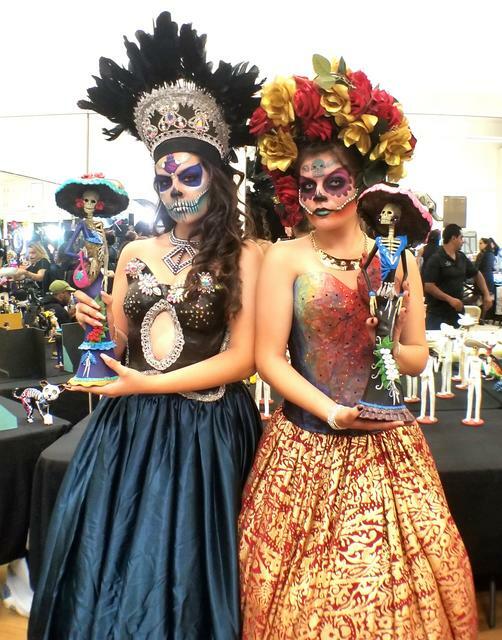 With a Bombs Car Show by LA-based global car club Hijeitos, airbrush face painting by the renowned makeup artists of H&MUA Studios, ERA and Machtres dance troops, a Catrina-themed fashion show and an onstage “wedding of the dead” you just had to be there. Music was headlined by the top ranked Pan-Latin cumbia band Buyepongo and the futuristic dance/old-school tropical band Subsuelo. 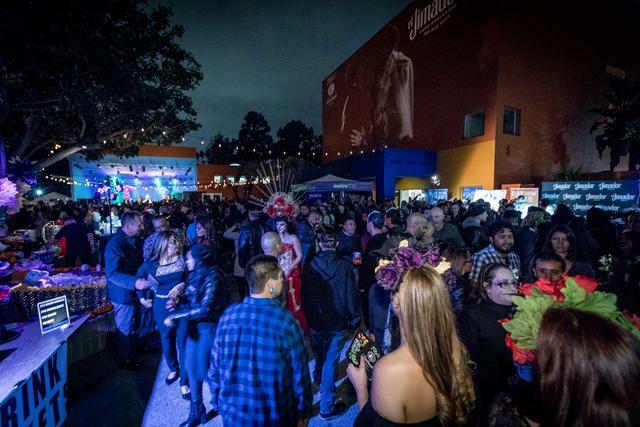 El Velorio was also the video release party by three-time Jazz and R&B award winner and mariachi band leader Nancy Sanchez making El Velorio the major event in LA leading up to the Big Day – if you could get a ticket. But the best part for me was the vibe. With at least three quarters of the 4500 people wearing costumes and dancing, the packed Plaza was a sea of happy, bilingual friendliness and welcoming. Everyone took care of everyone else, from letting abuelas (grandmothers) go to the head of the food line, to standing aside in the art gallery for shorter people to see the work on the walls, to switching languages depending on who they were talking to, everyone treated everyone else like la familia. 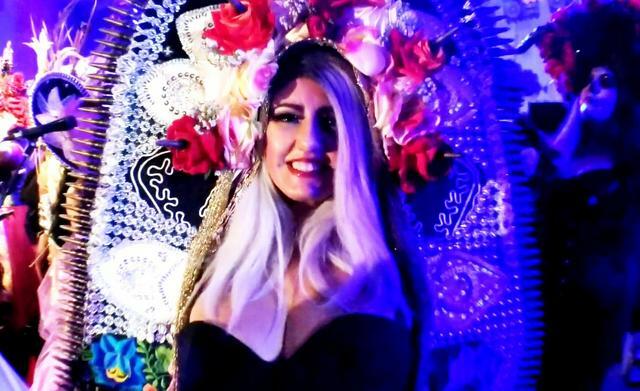 The high point for me was the release of Nancy Sanchez’s video of the 1960 Rosie and the Originals hit Angle Baby, projected on a 40 foot tall wall while Nancy sang from the stage, decked out in her own Dia de Los Muertos costume and headdress. 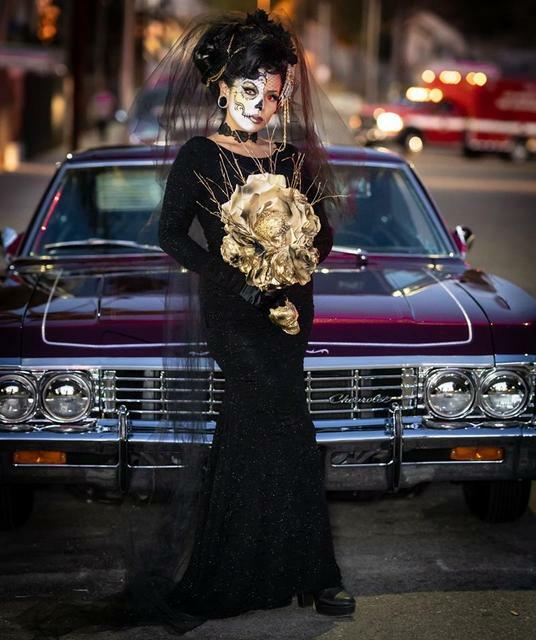 In 9 days the Hollywood Forever Cemetery will open with the blessing by the priestess, the Aztec dancers, some of the same musicians, and 40,000 friendly people in costume for Dia de Los Muertos. I will dig out my costume from last year and get it cleaned, find a face painting artist and become a calavera, and erase everything else from my calendar for the day. I will be ready to go for tequila, beer and dead people.